Wallpapers, commonly referred to as desktop backgrounds, are very popular. One does not need a lot of computing expertise to display them and they offer noticeable computer customizations. Everything is fine as long as only one wallpaper needs to be displayed on the desktop. It gets complicated if multiple images need to be displayed at the same time. The free portable application Overlap Wallpaper offers one of the easiest options to add a second image to the active desktop wallpaper. The basic idea of the developer was to give users an option to add a smaller photo of their loved ones, or something that they hold dear on the monitor without affecting the active wallpaper image. The second image at the same time will display even if the primary wallpaper changes, for instance if a desktop wallpaper changer runs in the background. Click on browse to pick an image from the local computer system. This image is then added on top of the existing desktop background. You can alternatively copy and paste an image with its full path into the form directly. The photo size sets the dimensions of the image in pixels. The image height and width will automatically be reduced if a smaller size is entered on the configuration screen. You can use -1 to use the actual image size. It is theoretically possible to display two wallpapers at once on the screen that both fit the full screen. The transparency of the overlapping image needs to be selected accordingly so that both images are shown on the screen. The photo position fields determine the location of the photo on the screen. You may need to experiment with different values here to position it correctly on the existing desktop background. Just think of the desktop as a series of dots that equal the screen resolution, for instance 1920x1200. If you wanted to place the photo at the top right location you would select an x position value of about 1820 and an y position value of 10. If the image is larger, you may need to reduce the x position value so that it fits on the screen. Click apply after making changes to save them. It takes some time before the changes become visible on the screen. 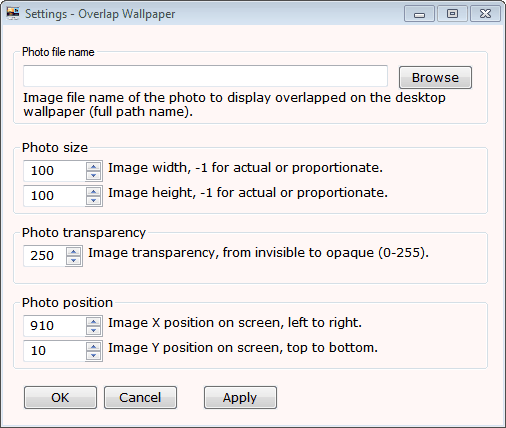 Overlap Wallpaper is an interesting program, handy for users who want to display a photo or image on the screen at all times. It does not have to be a photo of loved ones or something that they hold dear, it can also be an image with important textual information. Overlap Wallpaper is compatible with all recent 32-bit and 64-bit editions of the Microsoft Windows operating system. It worked fine on a 64-bit Windows 7 Pro test system. Downloads are provided at the developer's website over at Google Code. Thanks Martin, for the writeup. I will try to add features, if possible, as per user request, to make it even better. Can you PLease add Text support to this. Like if I wanted to pick a ‘new dictionary word’ each week to display so I may expand my vocabulary. ya I can do this in photoshop. but it would be sweet if the app supported this. It should be resizable other people may want an entire quote to make a presence in their life. I made Active Text Notes, https://sites.google.com/site/activetextnotes/, for similar requirement. Please check it. Now, Overlap Wallpaper 1.5.0 has “Preview mode”. All changes in values are automatically applied to the photo. Absolutely wonderful! I have been looking for a tool like this for years. So thank you for the tools you create. I put the quote in because it answered a lot of people’s questions on how and why people such as yourself can and why they create free software. Overlap Wallpaper Version 2.6.0 is released. You may check it. Excellent. Works with Windows to 10 too.